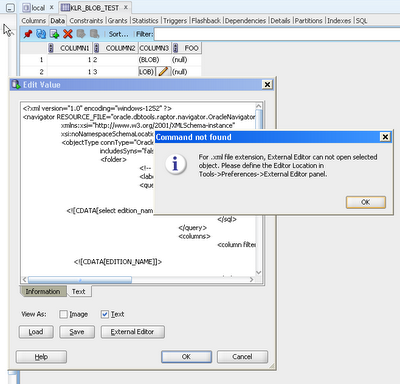 Another new thing in this RC1 is the ability to easily edit blobs in the database. We've had the save and load from file as well as the ability to show the text of the blob but now we're interrogating the blob to figure out what it is. The code is starting with what should be fairly common file types and we'll expand as we go. There's a new button on the BLOB view dialog named External Editor. When you press this, you may get prompted to go define an editor for this type. Here's what it looks like for XML stored in a BLOB. 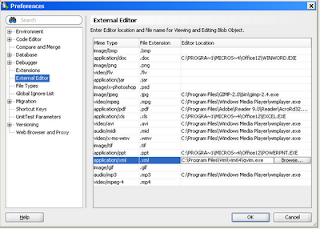 Defining the editor is located in the preferences. I'm going to setup VIM as the editor of choice for all *.xml files. Now when I press the External Editor, gVIM launches. What is happening is that there is a temp file created and called via command line from SQL Developer. The launching of the external tool is monitored so that when that tool is closed the temp file is re-loaded into the database into the BLOB content. Which is why you'll see a * next to the row indicating that there was a change made and it's awaiting a commit or rollback. 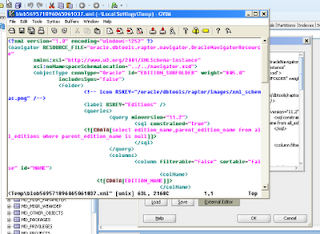 Now editing images,documents,xml stored in the database is greatly simplified.